Dr. Ziolkowska’s primary research interests include policy evaluation, modeling and decision-making support in the field of natural resource, environmental, bioenergy and agricultural economics, as well as sustainable resource management. Her current research focus is on optimizing water management systems, desalination, biofuels and geospatial and spatio-temporal analyses. Dr. Ziolkowska participated in interdisciplinary research projects with scholars from the US, Germany, England, Belgium, Norway and India. This allowed her to understand a large scope of sustainability and other economic and environmental problems in different countries around the world. In 2009-2012 Dr. Ziolkowska was a post-doctoral scholar at the University of California at Berkeley and an EU Marie Curie Fellow in the 7th Framework Program. During her fellowship she developed a fuzzy logic multi-criteria optimization framework to support decision-making for sustainable biofuels policies in the US. In 2013-2014 she continued her research at the University of Texas at Austin. She developed an approach to estimate economic value of water for irrigation in the High Plains. In addition she evaluated socio-economic impacts of drought in Texas as well as economics of desalination in the US and at the global scale. 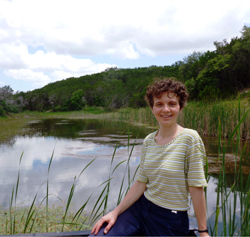 Within the EPSCoR NSF project Dr. Ziolkowska works on socio-economic and ecological system models to examine interactions of climate variability, ecosystem services and cultural values in Oklahoma. Research Focus: Performing literature research and prep work for an environmental information contingent valuation survey.